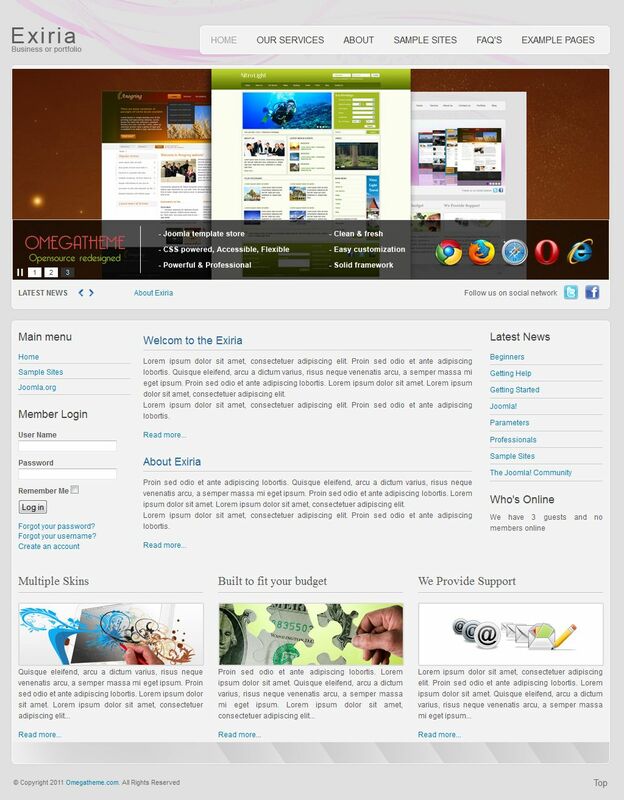 OT Exiria - a fairly simple template for the site from a small extension to the Joomla developers OmegaTheme! Like most works template OT Exiria distributed free of charge! Although the template is positioned in the market as the basis for a small site, it may well be used for bigger sites, including corporate portals. OT Exiria adapted for Joomla 1.5 - Joomla 2.5. 17 module positions allow you to customize the template to suit your needs without understanding your code. While making some revisions in php files will not be hard, because almost every team is well commented. In the template module built marquee, which can be displayed, for example, the latest company news. And in general the pattern is very flexible and functional, despite the apparent prostate. We should also note the presence of a convenient slide show, which also has a number of settings.